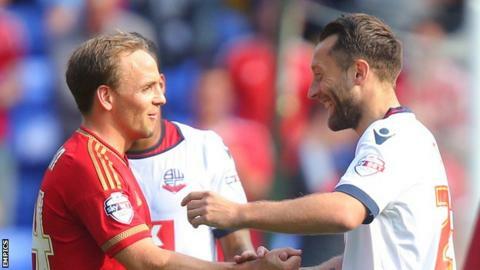 Injury-time substitute Stephen Dobbie rescued a point for Bolton with a 93rd-minute equaliser against Nottingham Forest at the Macron Stadium. Dobbie's goal was Bolton's first in seven matches, dating back to 18 April. David Vaughan had come off the bench to put the Reds ahead with a 25-yard strike into the top corner late on. Earlier, Forest goalkeeper Dorus de Vries denied Gary Madine from the penalty spot after Zach Clough was brought down by Matt Mills in the area. But Dobbie drilled home his first Trotters goal from 20 yards to ensure Bolton avoided their fourth straight defeat in all competitions. Bolton's last goal came in a 2-2 draw at Brentford 126 days ago. The Trotters went on to lose their last two matches of the 2014-15 season and have taken just one point from four Championship games this season, having also been knocked out of the League Cup by League One side Burton Albion earlier this month. Forest boss Dougie Freedman, who returned to the Macron Stadium for the first time since leaving Bolton last October, gave Spanish defender Daniel Pinillos and on-loan FC Twente midfielder Kyle Ebecilio starts on their debuts, while Michail Antonio was recalled four days after being left out of the draw with Charlton following a bid from Derby for the winger. Bolton's Brazilian winger Wellington Silva, who arrived on loan from Arsenal during the week, was bright early on in his first appearance for the club. In an uneventful first half, Ben Osborn, Henri Lansbury and Antonio threatened for Forest, while Dorian Dervite put two headers over the bar from Dean Moxey crosses before Clough glanced wastefully wide from a Tom Walker free-kick. De Vries compounded Bolton's woes in front of goal when he got down low to his right to keep Madine out from the spot, with the striker then off target with his follow-up effort. The penalty save sparked a flurry of chances at both ends, with Vaughan eventually opening the scoring with a superb strike from distance before Dobbie made a late impact with his well-placed shot from outside the box. Bolton manager Neil Lennon: "We should have won the game. "Our football was good and we contained Forest to the odd counter-attack. But we lost a goal to another wonder strike and you hold your hands up and say, 'Good hit'. But the reaction was excellent. "They showed a lot of character and we did more than enough to win the game which has been the story of our season so far. We didn't look like a team who are second bottom." Nottingham Forest boss Dougie Freedman: "I am disappointed being 1-0 up with a few minutes to go. But overall it was a good performance and I have no complaints with the result. We looked reasonably comfortable until Bolton got the equaliser." "It was always going to be a challenge for myself and the team coming back here. But no one can take away how hard I worked for the football club. No doubt the club was in decline and I couldn't stop that decline. "Deep down most Bolton fans understood the circumstances. We missed out on the play-offs by one goal and they knew then it was going to be difficult for the next couple of years." Match ends, Bolton Wanderers 1, Nottingham Forest 1. Second Half ends, Bolton Wanderers 1, Nottingham Forest 1. Goal! Bolton Wanderers 1, Nottingham Forest 1. Stephen Dobbie (Bolton Wanderers) right footed shot from outside the box to the bottom left corner. Assisted by Mark Davies. Corner, Nottingham Forest. Conceded by Prince. Attempt saved. Emile Heskey (Bolton Wanderers) header from the centre of the box is saved in the bottom left corner. Assisted by Neil Danns with a cross. Attempt missed. Neil Danns (Bolton Wanderers) right footed shot from outside the box misses to the left. Substitution, Nottingham Forest. Daniel Fox replaces Tyler Walker. Substitution, Bolton Wanderers. Emile Heskey replaces Wellington. Goal! Bolton Wanderers 0, Nottingham Forest 1. David Vaughan (Nottingham Forest) left footed shot from outside the box to the top right corner. Assisted by Michail Antonio. Neil Danns (Bolton Wanderers) is shown the yellow card for a bad foul. Matt Mills (Nottingham Forest) wins a free kick in the defensive half. Delay in match Prince (Bolton Wanderers) because of an injury. Tyler Walker (Nottingham Forest) is shown the yellow card for a bad foul. Prince (Bolton Wanderers) wins a free kick in the defensive half. Attempt missed. Michail Antonio (Nottingham Forest) right footed shot from outside the box is too high. Assisted by Henri Lansbury. Substitution, Nottingham Forest. David Vaughan replaces Kyle Ebecilio. Offside, Nottingham Forest. Dorus de Vries tries a through ball, but Michail Antonio is caught offside. Corner, Bolton Wanderers. Conceded by Jack Hobbs. Attempt blocked. Gary Madine (Bolton Wanderers) right footed shot from the right side of the box is blocked. Assisted by Liam Feeney. Attempt missed. Neil Danns (Bolton Wanderers) right footed shot from outside the box misses to the right. Assisted by Gary Madine. Attempt missed. Kyle Ebecilio (Nottingham Forest) right footed shot from the centre of the box misses to the left. Assisted by Chris Burke. Attempt missed. Gary Madine (Bolton Wanderers) header from the centre of the box misses to the left. Assisted by Liam Feeney with a cross following a corner. Attempt blocked. Dorian Dervite (Bolton Wanderers) right footed shot from the centre of the box is blocked. Assisted by Zach Clough. Corner, Bolton Wanderers. Conceded by Dorus de Vries. Attempt blocked. Zach Clough (Bolton Wanderers) right footed shot from the centre of the box is blocked. Assisted by Mark Davies. Attempt blocked. Tyler Walker (Nottingham Forest) right footed shot from the right side of the box is blocked. Assisted by Chris Burke. Attempt saved. Michail Antonio (Nottingham Forest) right footed shot from the left side of the box is saved in the centre of the goal. Assisted by Tyler Walker. Attempt missed. Gary Madine (Bolton Wanderers) header from the centre of the box misses to the left. Assisted by Liam Feeney with a cross.